Italian Hot Chocolate is a thick decadent hot chocolate that is perfect for all chocolate lovers – it’s made from real chocolate after all! 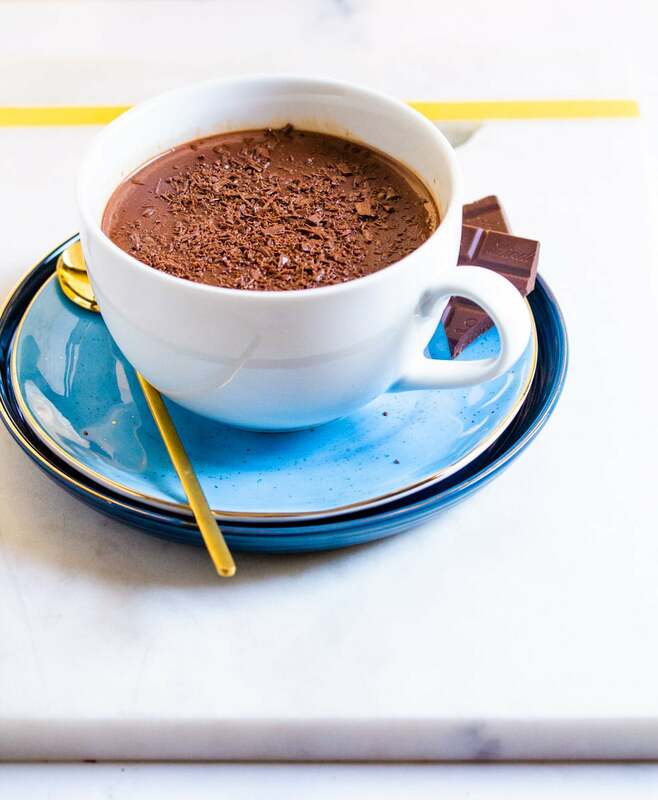 It’s similar to French Hot Chocolate, but the method is different. But one thing’s for sure, both are super delicious warming drinks perfect for the winter! My hot chocolate recipe collection is growing fast and furiously thanks to the awesome Hot Chocolate Extravaganza that I’m running on my blog these days. Whether it’s this Three-Ingredient Creamy Homemade White Hot Chocolate, or this citrusy Orange Hot Chocolate that you first choose to make, I can guarantee you won’t be disappointed! Picture this: You’re walking down a cobbled street in a small Italian town. It’s dusk time, and the wind is cold and blustery. You look around for a place where you can get a hot cup of coffee, and come across a small cafe. You ask for coffee, but your Italian is poor and the barista keeps saying something like Cioccolata Calda, Cioccolata Calda. You have no idea what it is, but nod your head in agreement and hope it’s something warm and comforting. After a few minutes he hands you a big, warm mug of liquid chocolate. At least that’s what it looks like. And then you take a sip, and you die and go to chocolate heaven. Okay, you don’t actually die and go to chocolate heaven. But that’s how it feels as this magical liquid runs through your body and warms you to your very, very cold bones. You look at the barista, and give him the biggest smile ever, because this is the best thing you’ve ever tasted in your life. And I mean, ever. You actually want to hug the barista, but don’t because that would just freak him out. Anyway you decide that you have found the love of your life (the Italian hot chocolate, not the barista lolz) and you live happily ever after. What is Italian Hot Chocolate aka Cioccolata Calda? Italian Hot Chocolate is basically liquid gold. Okay, but seriously it’s the best way to make hot chocolate in my humble opinion. It’s a thick and creamy hot chocolate made from real chocolate, milk and sugar. It isn’t like regular hot chocolate that’s made from hot chocolate powder and water. This is the real deal, people. 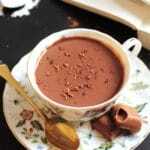 Italian Hot Chocolate is almost pudding like and perfect for very cold winter days. How Do you Make Italian Hot Chocolate? This Italian hot chocolate is basically the same thing as drinking a chocolate bar in liquid form. That’s because I used real chocolate (not just cocoa, although that makes a delicious appearance too, in this heavenly drink), namely Lindt, in this hot chocolate. A whole bar. OMG, a whole bar. Can you imagine what level this hot chocolate is on the deliciousness factor from 1 -10? Like hello, a 100! I kid you not. Now I have some instructions for you. If you follow these, you will be a very, very happy person soon. Take your favorite bar of milk or dark chocolate (I used Lindt), melt it with a bit of milk, add more milk, then add cocoa powder, sugar and corn starch, and stir until the hot chocolate is thick, thick, thick. So thick that it coats the back of your wooden spoon, and when you run a finger down the spoon the hot chocolate stays. And that’s when you know your hot chocolate dreams have come true. You’ll never go back to the common old hot chocolate, I promise you, now that you have met this Lindt Italian Hot Chocolate – Cioccolata Calda. 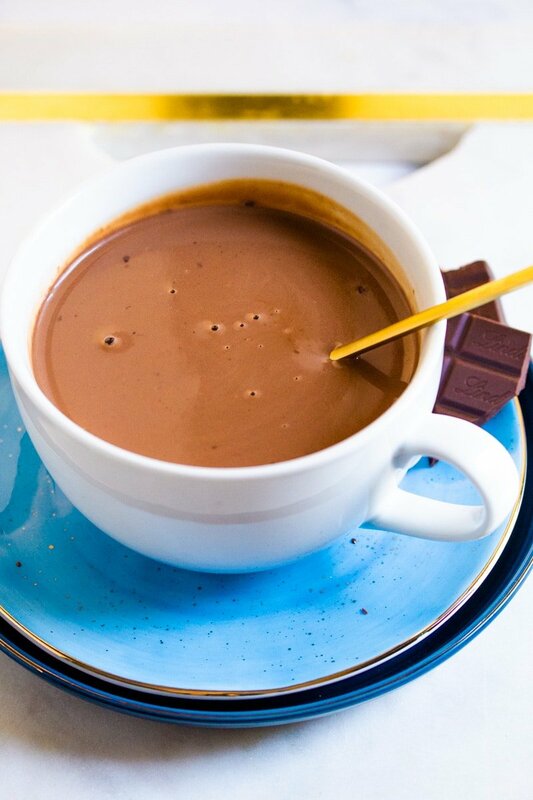 Italian Hot Chocolate is a thick decadent hot chocolate that is perfect for all chocolate lovers – it’s made from real chocolate after all! Ready in five minutes, using only five ingredients! In a medium saucepan, melt the chocolate with two tablespoons of milk on medium heat. Slowly add in the milk, continuously mixing with a wooden spoon. Add in the cocoa powder and sugar, mixing until fully incorporated. 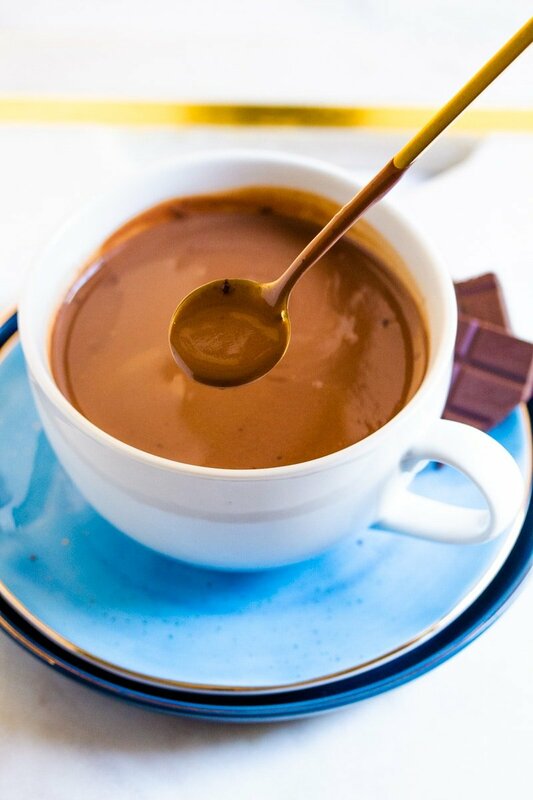 In a separate bowl mix the corn starch with one tablespoon of milk, and pour this mixture to the saucepan and mix until the hot chocolate has become thick and coats the back of your spoon. Top with cocoa powder, mini marshmallows or even sea salt. I used 2 tablespoons of cocoa powder because the milk chocolate itself is very sweet. If you are making this hot chocolate with dark chocolate then you may add less cocoa powder, depending on your taste. love the story , and the chocolate too 🙂 never tried it this way ! This is a must try! Thanks Farida! Glad you liked the recipe 🙂 The hot chocolate really is delicious and so simple to make too! OMG!!! Lindt chocolate & cocoa?? ok thank you very much. do you think skipping the cornstarch matters? i dont mind not being heavy if it doesnt affect the taste. Oh my! The pure decadence of it all is pouring right off of the screen! I need a cup of this right now! Heading to the kitchen! Yum! Thanks for sharing! Liquid, molten, Lindt Chocolate? Yes, yes, and YES! I can certainly see myself cozying up to this on a cold day. Hi Wajeeha, your homemade hot chocolate looks delicious! I was just wondering how much sugar to use? Perhaps the amount is there but I just couldn’t find it. yumyumyum! I love hot chocolate recipes and this looks goooood!!! YUM! This looks so rich and chocolatey. I need to remember this one for the holiday season! I’m in chocolate heaven just reading about it … can’t wait to try it this way and experimenting with different kinds of chocolate too (i.e. chocolate caramel). I love my chocolate. This would make my day to have one of these. Yum!! I could see myself sipping on this decadent drink while reading a good book! Wow – this looks delicious! Definitely on my list for the holiday season. 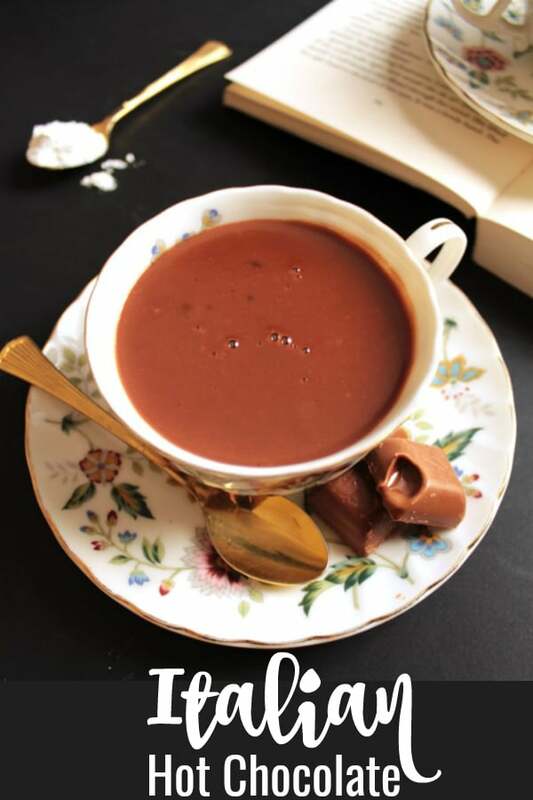 Lindt Hot Chocolate… YES PLEASE!! I know I would love this! Seriously it’s so good, I literally had to hide it from myself because I have a massive sweet tooth! Looking at your photos made me feel like I was in that Italian cafe. who cares what the waiter was saying .. this is worth trying!! I have officially died and gone to heaven. I love the thick Italian style hot chocolate, which I first tasted in Florence, on honeymoon. Making with Lindt is the way to hot chocolate perfection. Pinning, yumming and making… several times over. FYI chocolate in Italian is spelled “cioccolato” just in case you wanna change that 🙂 excited to try out this recipe, I had many hot chocolates during my year in Italy and it’s true, so much better than the normal kind! I have to try this recipe. Its perfect to start the day with the hot chocolate like this. And as an italian, I was shocked to discover that the rest of the world thinks that ‘hot chocolate’ is basically chocolate-scented water (in comparison to ours), sooo disappointed! Welcome to I Knead to Eat where I share SUPER easy and delicious recipes from my kitchen to yours!